Corvo or Emily. Stealthy or overt. Deadly or non-lethal. 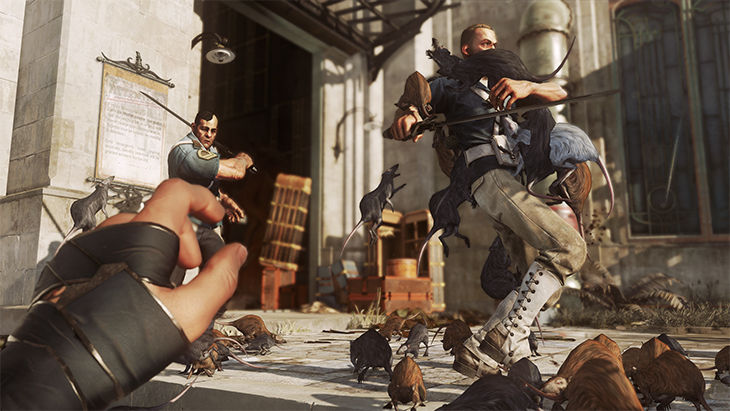 These big choices are at the heart of Dishonored 2 – but just like the game’s rich setting, there’s so much more lurking right beneath the surface. Dishonored 2 also abounds with additional layers of player freedom thanks to its wealth of customization options. Which powers will you choose? How will you upgrade those powers? Which Bone Charms will you activate? And how will you modify your weapons? With Dishonored 2 releasing globally on November 11 for PlayStation 4, Xbox One and PC, here’s a sneak peek at some of the new customization options in the game. 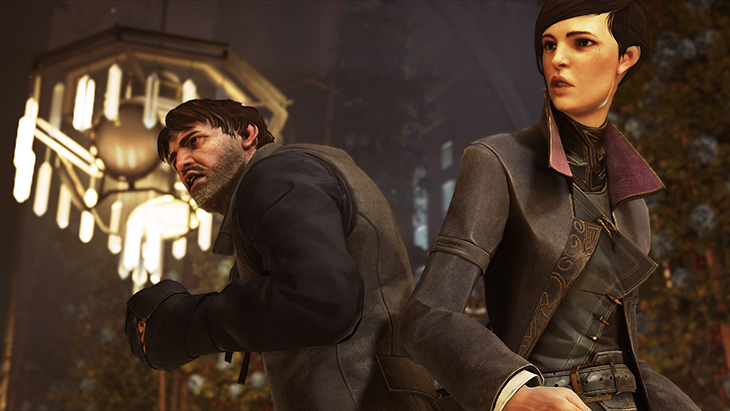 In Dishonored 1, you took on the role of Corvo Attano, the Royal Protector who was framed for the assassination of Empress Jessamine Kaldwin. 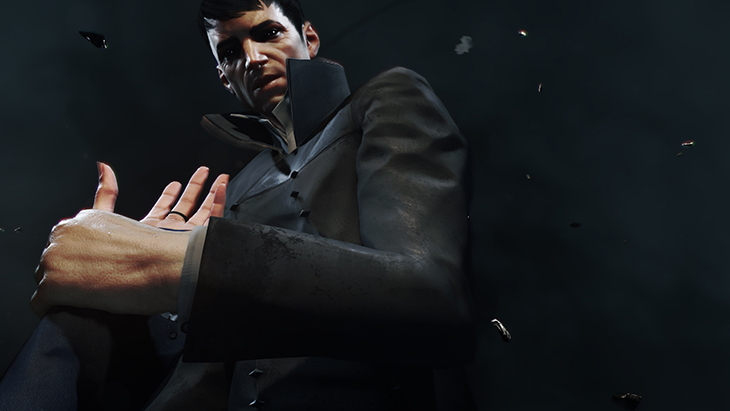 Early in the game, Corvo is marked by the Outsider and granted supernatural powers. You could then customize your experience by using Runes to purchase additional powers and upgrades. Same goes for Emily, who also has full upgrade trees for her powers. "It’s not only about expanding the powers, but expanding them in ways that are fun – that allow for creative play,” Bakaba says. One example that Bakaba shared: He’s seen playtesters upgrade Domino – which links together the fates of two characters – so they can connect multiple characters, then summon a Doppelganger, link their own double to several enemies, and kill their Doppelganger to take out their foes. "It’s mind-blowing what our playtesters have already done with her powers,” Bakaba laughs. Bonecharms also return from the first Dishonored. These carved pieces of whalebone are often carried by superstitious sailors as a means of protection – or just to keep them warm at night. But for Corvo or Emily, Bonecharms have real power. 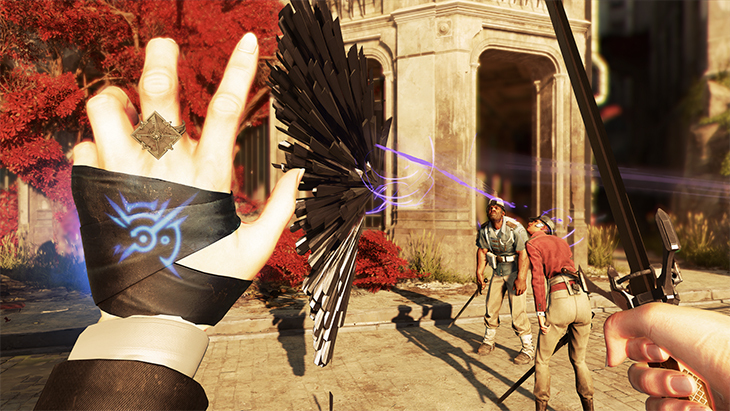 And now, in Dishonored 2, those powers have been extended and enhanced as well. While you can harvest only one trait from each Bonecharm, you can eventually upgrade your crafting skills so you can create Bonecharms with up to four traits – including the option to stack the same trait. "You can make Bonecharms that are really cool and complement the way you play,” Smith says. Plus, if you upgrade your gear, you can carry more Bonecharms, giving you additional flexibility to enhance your playstyle – even swapping out Bonecharms as needed when facing specific situations. As before, you can upgrade your tools, weapons and gadgets. Your crossbow can become more powerful, or fire different bolts. You can extend the radius of your spring razor mine. You can invest in your boots to enhance your stealth. But Dishonored 2 also introduces a new level of upgrade: Masterworks. First, though, you have to find the right Masterwork Blueprint. Then you’ll have a choice to make – and when it comes to the crossbow and pistol, these choices are unique for Emily or Corvo. For example, if you find the Masterwork Blueprint for Emily’s gun, you can upgrade it so it shoots with bursts of three bullets at a time – or you can make it fully automatic, so you’ll never have to reload. "You can actually turn it into a named weapon,” Bakaba says.